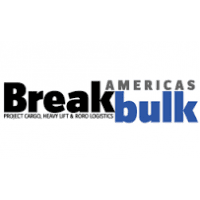 Breakbulk Americas' targeted programming will ensure that you develop skills and strategy to help you do your job more effectively, while increasing your networking. It is the place to meet leading executives and other shippers who travel throughout the Americas and around the world. Exhibitors and sponsors include specialized marine carriers, freight forwarders, ports / terminals, logistics service providers, road, rail, barge and air transportation, export packers, equipment companies and more. The next event will be October 08 - 10, 2019 .